Faith Community Helps Steady National Cathedral After Quake When the earthquake rumbled along the East Coast last month, the National Cathedral — which hosts major events such as state funerals and inaugural prayer services — lost handcrafted cherubs and pinnacles on its central tower. Now, it faces major financial challenges in rebuilding. 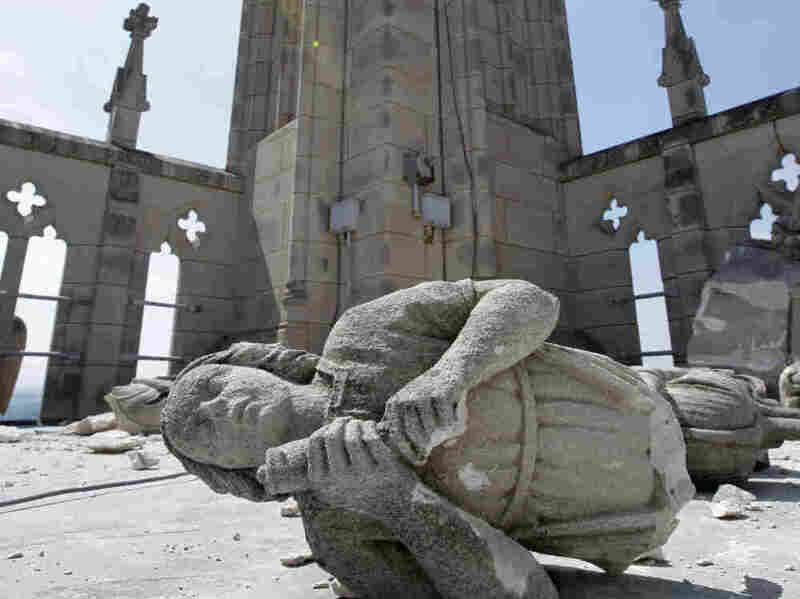 An angel, carved from Indiana limestone, lies shattered amid other damage on the roof of the Washington National Cathedral after an earthquake struck on August 23. The cost of repairs could run "well into the millions," a church official said. The National Cathedral has hosted some of the most memorable prayer services and state funerals from the past 100 years. President Obama will speak there on Sunday to mark the 10th anniversary of Sept. 11; he also held his inaugural prayer service at the historic church, like many presidents have done. But the structure was hit hard by last month's 5.8 magnitude earthquake that rattled the East Coast. Now, it could take years for the landmark to recover. 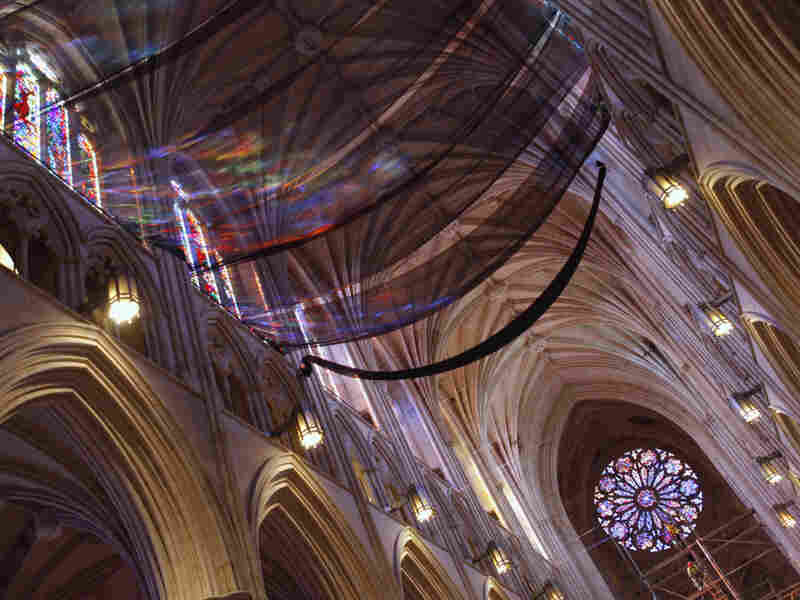 Light from stained glass windows shines onto safety nets that have been installed along the ceiling of the nave at the National Cathedral, as a precautionary measure after parts of the structure was damaged in an earthquake. Chips of fallen mortar look like specks of gravel in Joe Alonso's large calloused hands. "This is the sort of material that came down during the quake, and this is what the netting is there to catch," he says. Standing in the nave of the Cathedral, Alonso, the head stonemason, watches as crews begin attaching the nets to the 100-foot vaulted ceiling. He jingles the chips in his hand — the same hands that 20 years ago helped put the final touches on the gothic-style cathedral. "It's heartbreaking to me, because I know what went into building this building. [When] I look at a piece of stone, I can tell you what that stone went through, from [when] it was designed by the architect, sculpted, carved [and] laid in place by the stonemason," Alonso says. "This is a handmade building." Construction on the Episcopal cathedral began in 1907, after Congress granted a charter, and it took 83 years to finish. Modeled after the gothic-style cathedrals of Europe, the National Cathedral was built the old-fashioned way, with solid blocks of limestone placed on top of each other. They're great for building epic cathedrals, but not so for absorbing the energy of earthquakes. "To me, it looked like the cracking of a whip," Alonso says of the earthquake's effect on the structure. "Everything just went up, and up, and up, and up and through the pinnacles and spires." Pierre L'Enfant, the French designer of the nation's capital, first envisioned "a great church for national purposes" in the late 1700s, but plans did not begin in earnest until 1893, when Congress granted a charter to the Protestant Episcopal Cathedral Foundation to establish a cathedral. Construction began in the presence of President Theodore Roosevelt in 1907, and ended 83 years later in 1990. At 83,000 square feet, it is the second-largest cathedral in the U.S., and has 215 stained glass windows, 110 gargoyles and approximately 700,000 annual visitors. The total cost for constructing the Cathedral amounted to $65 million, funded through private donations. Though the Cathedral is a non-profit organization that does not receive federal support, it is a venue for major events in the public sphere. In 1789, Congress passed a resolution that officials should "hear divine services" after the inauguration of President George Washington; the tradition endured. Every president since Reagan — except for President Clinton — has held their inaugural prayer service at the National Cathedral. The Cathedral has been the site of other significant services including three state funerals, for Presidents Eisenhower, Reagan and Ford. After President Kennedy was assassinated, the Cathedral held prayer services and kept an all-night vigil. In 1968, the Rev. Dr. Martin Luther King, Jr. gave what would be his last Sunday sermon at the Cathedral. And in 2001, President George W. Bush held the National Day of Prayer and Remembrance at the Cathedral after the Sept. 11 terror attacks. Alonso says the real damage is up top on the Cathedral's central tower, where three of the four 40-foot pinnacles were damaged. "The pinnacles there are adorned with these beautiful little angels and cherubs, these little faces," Alonso says. "Several of those have broken off and fallen on the roof." But engineers say despite the damage to the exterior, the church is structurally sound — and it better be, with President Obama and other top officials speaking here later this week. But the tougher question is: How will the Cathedral pay for the repairs? The Cathedral did not have earthquake insurance, receives no federal funding and had been hit hard during the recession, with several rounds of budget cuts and layoffs. "We are not getting a ballpark figure yet, except that it's going to be very high," says the Rev. Samuel Lloyd, dean of the National Cathedral. "Well into the millions." Rev. Lloyd says the Cathedral is now on firm footing, but there's no way it can pay for repairs itself, and is preparing a massive fundraising campaign. "Cathedrals are grand and beautiful and powerful, but they are very expensive to maintain," Rev. Lloyd says. "But this is the nation's church." And yet, despite the herculean fundraising challenge that lies ahead, Lloyd says he's been amazed by an unexpected outpouring of support from other faith communities. The Catholic Archdiocese of Washington donated $25,000 and made its largest church available for a memorial service. The Washington Hebrew Congregation has allowed the cathedral to hold its Sunday services there. "The phone calls have come in from people such as those saying how can we help, let us know what we can do," Rev. Lloyd says. And Alonso, the stonemason, says he's been getting a lot of calls and questions about a very popular carving: the Darth Vader grotesque. Not to worry, he says. Darth is just fine.